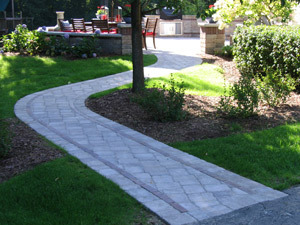 Oberndorfer Landscape Development specializes in landscape design and construction of commercial and residential sites. Since 2000, we have been a family business serving the Mequon area with superior service, craftsmanship, and attention to detail. Oberndorfer provides everything from landscape design and management to deck and patio installation. Contact the Ozaukee County landscape contractors at Oberndorfer for all your landscaping needs. Our experienced landscapers take pride in carefully designing beautiful landscapes. Oberndorfer Landscape Development takes care of every detail from design to implementation. You'll enjoy gatherings in your own backyard with friends and family on spacious patios and decks installed by our landscaping experts. We will work with you to bring your landscape ideas for your yard to life. Oberndorfer’s landscape design specialists also install pergolas and arbors, retaining walls, stone walkways, outdoor kitchens and outdoor lighting to make your yard appealing and functional. Hardscaping provides your home with a striking and visually appealing feature which will last for many years. Updating your front walkway from plain concrete to fieldstone or creating a brick patio with stone accents will boost the curb appeal and overall home value of your home. 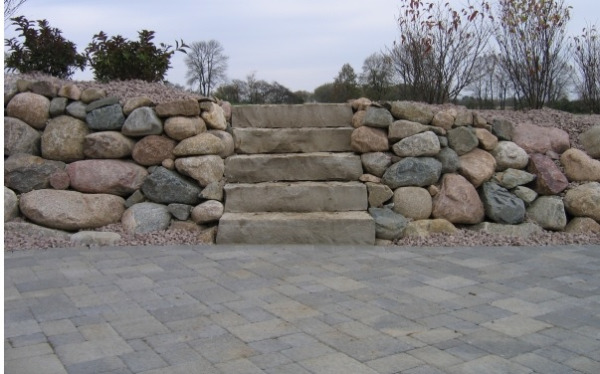 Whether you are looking for a patio with a fire pit, or a custom stone retaining wall, rely on the Ozaukee County landscaping professionals at Oberndorfer Landscape Development to turn your patio dreams into a reality. We use the highest quality stone materials from local suppliers, ensuring every hardscaping project is durable, bringing your visions to life. Oberndorfer Landscape Development also provides dependable lawn maintenance services to keep your yard in top shape. Our Mequon lawn maintenance specialists rid your yard of leaves in the spring and fall, trim overgrown trees and shrubbery and help maintain healthy grass to keep your yard looking beautiful. Keeping your lawn well maintained is not only important for preserving the beauty of your yard. You need lawn maintenance to keep unwanted weeds and pests out of your grass, garden and shrubbery. We can provide you with leaf removal, lawn mowing, fertilization, and implementing weed or insect control measures. Keep your trees healthy and your yard looking great year round with care services by Oberndorfer Landscape Development. We’re here for your trees whether you want to plant new saplings or need to remove an old tree. One of our many specialties is landscape planting installation. Our landscape design specialists will help bring your ideas to life. Creating the perfect outdoor landscape for your yard takes more than randomly placing plants in the ground. The layout of your plants needs to be well thought out. Plants need to have enough space and have the right amount of mulch around them to keep them growing healthy. Let Oberndorfer Landscape Development create your dream yard today. Turn your patio into a functional outdoor living space, perfect for throwing parties and relaxing, with the addition of an outdoor kitchen. Oberndorfer's Ozaukee County landscaping professionals will survey your existing backyard and layout, designing a backyard kitchen which will perfectly complement your yard. 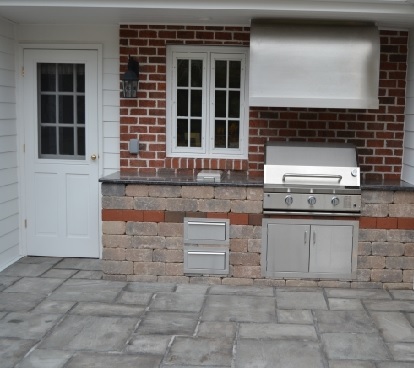 Our attention to detail and commitment to customer satisfaction is unmatched, ensuring quality design and installation services.There are many benefits to having an outdoor kitchen. Besides increasing property value, an outdoor kitchen allows you to easily entertain guests without having to leave the conversation to go inside to finish preparing the food. Custom designed decks can turn your backyard into an outdoor oasis. They create the perfect place to relax and unwind or meet with friends and family. We can design a beautiful composite deck to add your yard based on your budget. From built in seating to enclosed storage compartments, the Ozaukee county landscape contractors at Oberndorfer Landscape Development can make your dreams a reality. 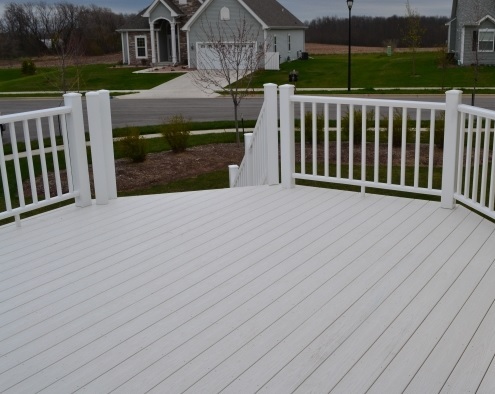 Composite decks are easy to maintain, with hardly any maintenance required. Your newly installed deck will not warp or rot, and is available in a wide variety of colors and styles. We are confident you will find a style to complement your home's exterior. 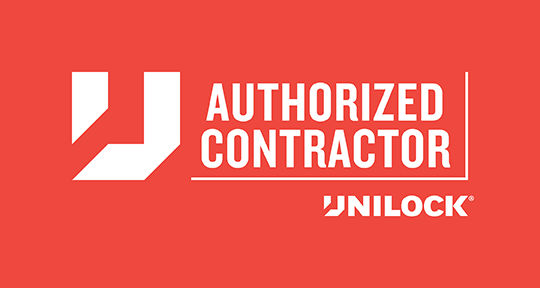 Splinter free, slip resistant and incredibly durable, a composite deck offers multiple long-term benefits over a wood deck. Outdoor lighting installed by our Mequon landscaping professionals can be used to highlight your favorite landscaping feature or guide guests along your paver walkway. Functional, decorative outdoor lighting provides your home with safety and charm. Ornamental lamps enhance your walkways during the day and provide much needed light when the sun goes down. Our talented team of landscapers can also install patio lighting to keep the party going well into the night. 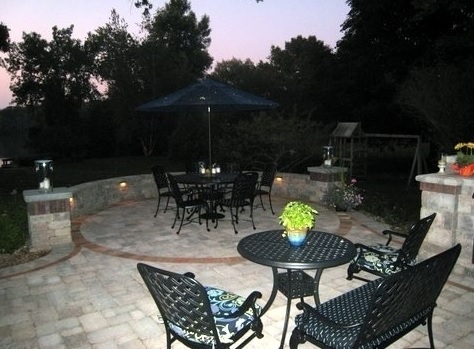 Outdoor patio lighting can be installed in the stone walls themselves, creating a unique glow. Oberndorfer Landscape Development provides a wide selection of lights from solar powered lamps to spotlights. Don't let your landscape vanish once the sun goes down. Our landscapers will keep your yard illuminated throughout the night. Backyard pergolas are a unique, distinctive focal point for any yard. They maximize your outdoor space, extending your patio by creating extra space for outdoor furniture, while still providing protection from the elements. Create an airy, inviting space where you and your guests can relax and unwind in comfort. A pergola is a quick and easy way to update your yard without going over budget. Vinyl fences can also be installed for privacy and for security. Oberndorfer’s vinyl fences provide many advantages over wooden fences. Vinyl fences are lower maintenance and will not rot or warp as the seasons change. 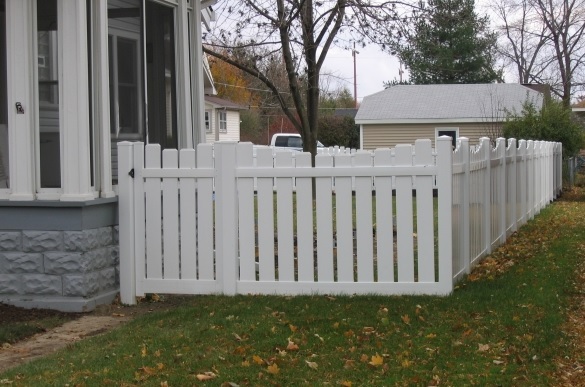 We offer a wide selection of colors and styles of fences to complement your homes existing color scheme. Create a backyard paradise and add dimension to your yard with the addition of a beautiful water feature. 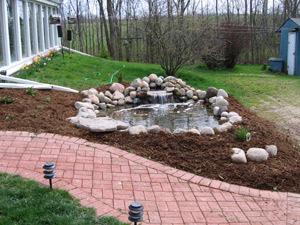 From small ponds to waterfalls, we can transform your entire backyard into an oasis. Relax to the sound of running water or sit back and watch as unique wildlife from turtles to toads gather in your backyard. Our team of landscaping experts will assess your entire yard to design and install the perfect water feature for your home. 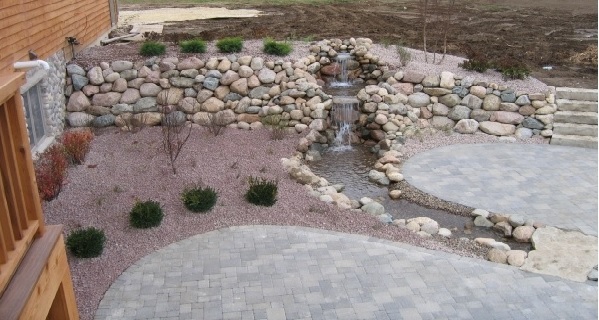 Enhance your backyard and turn it into a soothing retreat with our Mequon landscape contractors. Our Mequon landscaping experts design, install and maintain everything from grass lawns to backyard patios. Trust Oberndorfer Landscape Development to bring your landscaping ideas to life. Your home's exterior will be the envy of the neighborhood with our professional landscaping services. Contact Mequon landscapers from Oberndorfer Landscape Development today for innovative design and installation services.